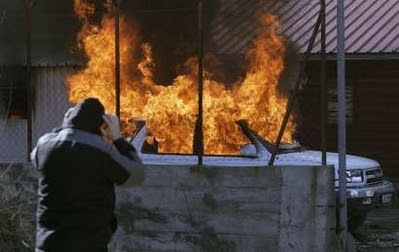 The Serbs continued their protests and attacks today at the border with Kosovo. Russia warns they may use force. 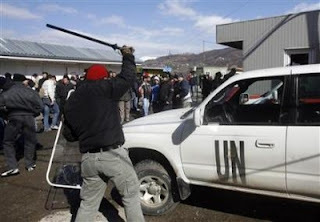 Serbian protesters attacked UN police guarding a bridge. Violent protests rocked Serb-dominated northern Kosovo on Friday, as mobs chanting “Kosovo is ours!” hurled stones, bottles and firecrackers at U.N. police guarding a bridge that divides Serbs from ethnic Albanians. The scenes evoked memories of the carnage unleashed by former Serb autocrat Slobodan Milosevic the last time Kosovo tried to break away from Serbia, which considers the territory its ancestral homeland. There were disturbing signs the riots in Belgrade, Serbia, and in Mitrovica have the blessing of nationalists in the Serbian government. The government hopes somehow to undo the loss of the beloved province, the site of an epic battle between Serbs and Turks in 1389. Prime Minister Vojislav Kostunica’s authorities have repeatedly vowed to reclaim the land, despite U.S. and other Western recognition of Kosovo’s statehood. Some hard-line government ministers have praised the violent protests as “legitimate” — and in line with government policies of retaining control over Serb-populated areas. In his first post-independence interview, Kosovo’s prime minister told The Associated Press that the violence is reminiscent of the Milosevic era. Russian President Putin warned the West that the decision to recognize Kosovo’s independence would come back and bite them. –Russia warned that they could use force if the situation escalates. Caroline Glick also warns about this troubling declaration by Kosovo and the impact it may have on multi-ethnic states. UPDATE: Jan sent this interesting article from The New York Times from 1987 describing the ethnic tensions in then Yugoslavia. As Slavs flee the protracted violence, Kosovo is becoming what ethnic Albanian nationalists have been demanding for years, and especially strongly since the bloody rioting by ethnic Albanians in Pristina in 1981 – an “ethnically pure” Albanian region, a “Republic of Kosovo” in all but name.